← Does it make sense for carriers to attempt another mobile billing standard? Bango is the mobile payment provider behind Facebook’s latest innovation: Promoted Posts. The service allows Facebook users to pay to promote their personal status updates, pushing them to the top of other users’ newsfeeds. Promoted Posts is beginning its global rollout, and the payment process is powered by Bango for users on the mobile web. The service, originally named ‘Highlight’ was first trialed in New Zealand in May 2012, and was then expanded to other countries around the region. Now renamed as Promoted Posts, the service has been launched to selected users in the United States, United Kingdom, France and over twenty other countries, according to a Facebook announcement on October 17th. Facebook is planning to experiment with the cost to ensure it’s appropriate to the different markets in which it operates, but today the cost is $7 across all countries. The payment can be quickly and conveniently charged to the user’s phone bill through Bango, without disrupting the posting experience. Facebook users can promote posts they’ve shared recently, typically within the last 6 hours. Group posts and private messages can’t be promoted, and people with 5,000 or more friends / subscribers can’t promote their posts. Promoted posts appear in the newsfeed and are labeled ‘Sponsored’. Crucially, promoting a post doesn’t actually affect who can see it – Facebook’s ‘EdgeRank’ algorithm controls that. Instead, it bumps the post higher in newsfeeds so more of the people you shared it with will notice it. 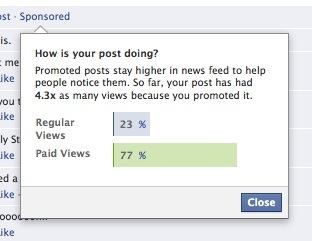 Here’s how the results of Promoted Posts are shared. This entry was posted in Mobile payments and tagged Promoted posts. Bookmark the permalink.